1. Lock Max & Erma in with hay. Please feed blue string hay at night. 2. Bring Razzle & James in center, re-latch rope around center gate using double clip. 4. 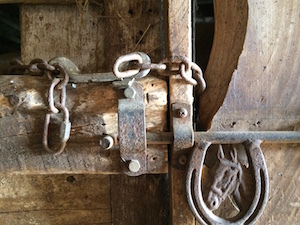 Return to barn and put Solomon in the inside stall with latch and chain. 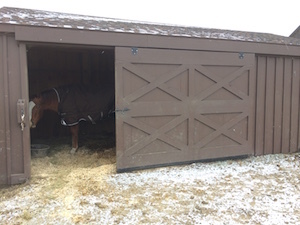 Remember to hook bottom door and double check he has hay - sometimes, AM feeders forget to preload his manger. 5. Using rope, stall Levi & Shawnee from the left paddock in stall 1 and 2, then take Sunny from the barn to stall 3. 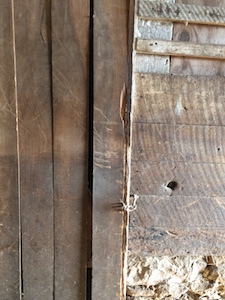 Close and latch both bottom and top doors. 6. 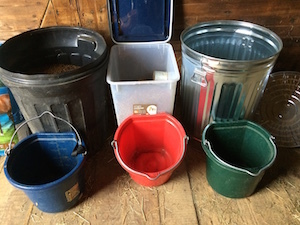 Go upstairs to feeding area and prepare feed for Jack: 1 scoop of senior feed (black garbage can) and 1 cup of Boost (center container) in red bucket & 1 scoop of alfalfa pellets (metal garbage can) in green bucket. 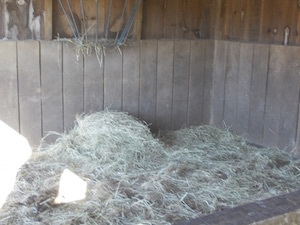 Take 3 or 4 flakes second cut hay (if he ate most of it) using better quality hay stacked by old stove. 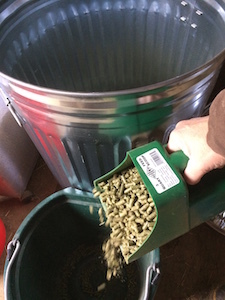 Grain is put in his bucket hanging in stall and pellets go in tub on floor by window. Slide shut and latch his door. 7. Go upstairs and throw blue string 1 bale + a flake or 2 down in large room. Split into 3 piles: 2 on left, 1 at back right side. Important to do this 1st before bringing in the last three. 9. Using an orange string bale (day time feed), preload Bud, Coach & Luke shed. 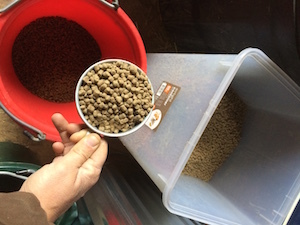 1 scoop of grain placed in Bud's tub inside shed. 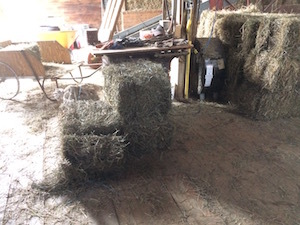 Split bale in 3rds: 1 pile on left, middle, and right. 10. 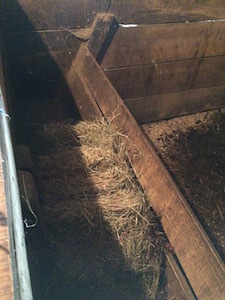 Preload left shed, 2/3 orange string bale, split into 2 piles, put 1 on each side under the hay rack. 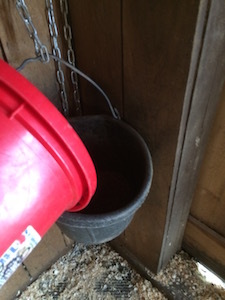 Put 1 scoop of senior feed in hanging bucket in corner. 11. 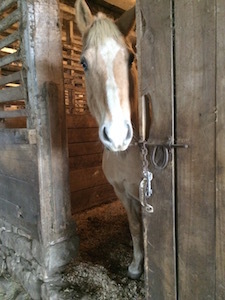 Turn off all outside lights, upstairs lights, close outside gates and doors, then return to inside barn, walk through inside rooms and latch sliding doors on both sides. Turn off lights and latch close doors. 12. 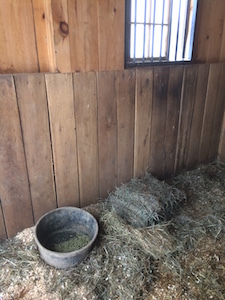 If throwing hay for the week, stack hay on floor (25 each type) & below (filling two straight stalls), please use blue strings and orange string bales from left side (elevator side). Blue is stacked upper top. Reserve the hay on right side for now.